A particularly good flowering cherry tree, Ukon has delightful hanging clusters of pale pink buds opening as semi-double pale greenish to creamy-white flowers from early Spring. A spreading tree - its large green leaves turn a rich rusty-red to coppery bronze colour before shedding each Autumn. Expect a height of around 6m at the 10 year point. It may go on to grow a few metres more but this is is weather and soil condition related. The Ukon is listed as 4 in the blossom scale, which means it is considered a later flowering variety compared to the other 4 groups (there are only 5 in total). The flowering period is April/May so late April or Early May should see the flowers breaking through. Weather and location can push this forward or backward. The Ukon flowering Cherry tree has won the RHS Award Of Garden Merit, not for collecting enough tokens off that back of a cornflake packet but because it has outstanding characteristics when compared to other flowering Cherry trees. 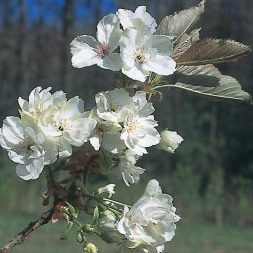 It will tolerate chalk, sand, loam and clay soil as most other flowering cherry trees will however incorporating some well rotted organic matter in the hole when planting will speed things along. Acid, neutral or alkaline soils are also not a concern for the Ukon. If possible plant in a full sun position that can be either sheltered or exposed. As the Ukon is such a spectacular tree, it will be of no surprise to find it in parks, avenues and public gardens. Prunus Serrulata Ukon as a rule requires little to no pruning other than to remove dead, diseased or cossing over branches. Should you be unhappy with the shape of the tree e.g. if the crown is too open (not very thick foliage) then consider pruning some of the larger branches back to encourage new growth. The concept is where you cut once 2 branches should grow making the crown thicker and fuller. This tree is supplied at a height of between 1.5m to 2.40m and in a 7-15L container. There is such a wide variation in pot size because it depends which supplier gives us the best deal at the time. These will most likely come as a Half Standard shape which means it has been pruned to be more of a lollipop shape with clear stem. If you do not want this ornamental Half Standard shape then you could buy 3 or more of these, plant them VERY close together and they will look like a bush and our sales target has been made that much easier to achieve. You can plant containerised Prunus Yukon any time of the year. 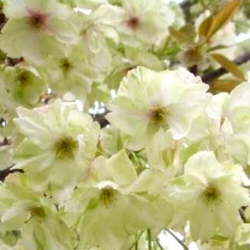 Our Prunus Ukon will be at least 2+ years old when you buy it. If you buy just before August, it will be closer to 3 years old.